I apologize for not posting much. I don’t really like to post short entries that are kind of stream-of-consciousness. I like to let something set in my mind and marinate for a bit, so I know I have a good-sized entry. I love longform journalism, relish the chance to engage in it and ultimately mourn its death, but that’s neither here nor there. I argue with myself, internally, and make sure each point I make is valid. This is why I’d make a crummy columnist. If I can see even a little bit of fault in one of my claims, I’m not writing. I’ve got a post rolling around in my head about Tim Lincecum and Dr. Mike Marshall, but I want to let it gather some seasoning before I sit down and proceed to write anything. Which ad do you think more people paid attention to? I’ve been trying to pay more attention to the health care issue, something in which I personally got a closer look in dealing with Congressman Jerry McNerney, following him on a tour of Sutter Tracy Community Hospital and listening in on a telephone town hall meeting. I’d rather not talk about those town hall meetings, which have been happening around the country, out of respect for my sanity. However, I’ve been reading how, in any reformed health care plan, there should be an emphasis on personal responsibility. I can’t stress this enough. A friend posted a link to a thought-sparking article from the New York Times, asking whether or not fat people should pay more for health care. A graph in the article shows that 9.1 percent of all medical costs in the country are obesity related. Well, as a fat guy… I say yes. l do take umbrage with one of the comparisons this article, and many people, make when they talk about obesity and health care. Comparing smoking to obesity is faulty for this reason: when you smoke outside of a building, you’re also giving away second-hand smoke, which is also quite unhealthy. When you eat a Big Mac and large fries outside of a McDonald’s, you’re not putting out second-hand fat. Smoking is a problem because not only does it pose an obvious danger to the smoker, but those around him. People who overeat or who don’t pay attention to what they put into their body are usually only doing themselves harm. While genetics does play a part in obesity, the main factor is behavior. Again, I say this as a fat man (not overweight, not fluffy, not big boned… I’m fat. I know this and accept it.) but there is no one forcing us to eat poorly. I know that I got where I am largely based on my personal choices. I take responsibility for my actions and I’m doing my best to rectify my situation, having lost about eight pounds in my 2+ week journey so far. At this age, I make a conscious choice to eat out. Watching TV instead of going to the gym is a decision. I feel like many people blame their genetics or otherwise rationalize their situation in an effort to avoid the big problem. Exercising takes energy, I know. But a little now can save you in the long run, no pun intended. Genetics are like life’s card game. What you do with the hand you’re dealt matters as much as the dealing of the hand, if that makes sense. I feel like there has to be a big wake-up call, but when I see things like this, it makes me sad. As corporate interests can win out over health, well, we’re getting closer to Idiocracy. Bad movie, but incredible message. Go rent it now. 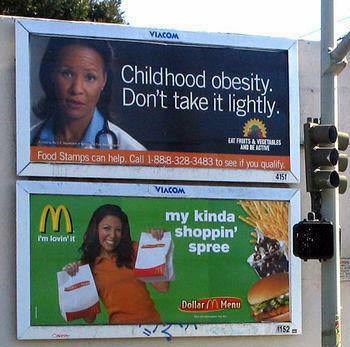 And eating unhealthily is something the poor economy even promotes. There have been two commercials recently that have made me shake my head. One is for the aforementioned KFC and their Variety Big Box Meal where you get, “a drumstick, a Crispy Strip, an individual box of Popcorn Chicken, two Homestyle sides, a biscuit and a refreshing 32-oz. drink.” All this for $7. Who really needs all that food? And KFC also ran a series of commercials, touting the “Family Meal Challenge,” comparing buying all the ingredients for fried chicken at the grocery store with buying it pre-made at KFC. The mom, with a couple kids in tow, looks at the price of all of the ingredients, sees it’s more than $10 and says, oh wow, it would just be cheaper to go to KFC! They left out the cost of an angioplasty. Another commercial that had me worried was a $2.99 Jumbo Deal at Jack in the Box. For that, you get “a Jumbo Jack® hamburger, two tacos and a small order of natural cut fries.” All for 29 points. I’m pretty sure after eating Jack in the Box, most people are loosening their belts. To sum up, I don’t necessarily feel that the condition of obesity in and of itself is a personal decision. But the choices leading to obesity (overeating, eating too many fatty foods, not working out, etc.) are usually personal decisions. So if you continue to ignore the warning signs and go ahead, making deleterious contributions to your health, well… yes, the extra fees should be assessed, if only to motivate a healthier lifestyle. Really like this blog post, Justin. Well said.